Starling - ZineWiki - the history and culture of zines, independent media and the small press. Starling was a science fiction fanzine by Lesleigh Luttrell and Hank Luttrell. Starling was first published in the 1960s in Missouri, U.S.A. The first two issues were published by Tim Eklund with Hank Luttrell and Roger Alan Cox (1964). Starting with #3, Luttrell published and edited it by himself, and was joined by Lesleigh Couch with issue #9 (1967), who became Lesleigh Luttrell in 1969. The two moved to Madison, Wisconsin, U.S.A. where they continued publishing. Early issues of Starling were distributed through the Southern Fandom Press Alliance APA. It was published for more than a decade, with issue 3 appeared in 1964 and issue 37 in 1979, the last issue so far. 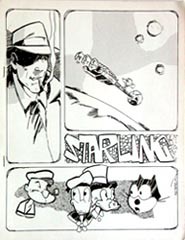 In 1975, Starling was nominated for a Hugo Award for Best Fanzine. In sf critic Rob Latham's article "Fanzine Research", in the April 2008 issue of el,, he wrote of Starling, Susan Wood's Aspidistra, and ODD, by Raymond and Joyce Fisher with Richard Elsberry, that they were, "vehicles of antiestablishment attitudes virtually indistinguishable at times from the contemporary underground press.” He cites these fanzines as examples of sf fans seeking "...to bring sf into dialogue with a larger universe of discourse and action—rather than, as elitist snobs sometimes suggest, looking to “escape” from the real world into aimless fantasy." Contributions of writing were by Grant Canfield, Michael Carlson, Juanita Coulson (Yandro), Roger Cox, Andrew Darlington (Ludd's Mill), James Dorr, Barry Gillam, Richard Gordon, Steve Grant, Clay Hamlin, Terry Hughes (Mota, Science Fiction Five Yearly), Dwain Kaiser, Jerry Kaufman (The Spanish Inquisition), Leo Kelley, Banks Mebane, Tom Perry (Quark), Joe Sanders, A.M. Schneider, Greg Shaw (Entmoot, Feemwlort, Mojo-Navigator Rock & Roll News), Angus Taylor, with his column called "Sgt. Pepper's Starship", Bob Tucker (Le Zombie), and Jim Turner. Contributions of poetry came from Jerry Kaufman (The Spanish Inquisition), among others. Contributions of artwork were by John Berry, Sheryl Birkhead, Grant Canfield, Ken Fletcher, Tom Foster, Alexis Gilliland, Jeanne Gomoll (Janus), John Ingham, Jay Kinney (Nope! ), Denis Kitchen, Gene Klein (a.k.a. Gene Simmons) (Faun), Joe Pearson, Marc Schirmeister, James Shull (The Essence), Dan Steffan (Boonfark), and Reed Waller. Letters came from Douglas Barbour, Leigh Brackett, Juanita Coulson, Ray Nelson and Susan Wood. Hank Luttrell also published Sirruish in the 1960s. Lesleigh Couch Luttrell had previously co-published Quark with brother Chris Couch. This page was last modified on 17 October 2018, at 13:15. This page has been accessed 27,599 times.